Water Fountains For Sale in Grimsby and Stoney Creek - Legends Landscape Supply Inc. 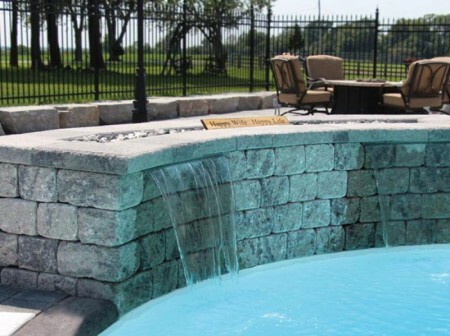 Capture the peacefulness of nature by introducing a water feature into your property. You can make your property eye-catching after sundown by selecting one of our unique water fountains that feature a colour changing light show. If you entertain outdoors often throughout the warm months, this feature will really make your property standout. Sit back and enjoy the calming sounds of running water from a natural looking yet easy to install water statue. One of our most popular models is a simple pillar of basalt rock that can integrate perfectly within any garden or patio area. For the homeowner that is less DIY inclined, our kits are perfect for introducing a calming and impressive water feature to any property. Our kits include a pump and basin, and remote control. They can be easily set up in under an hour, allowing you to add an effortless focal point for any occasion. Visit our Burlington location to browse dozens water feature options for your landscape, from fountains to bubbling rocks to waterfalls and ponds. Our expert landscape professionals can help you turn your dream into a reality.